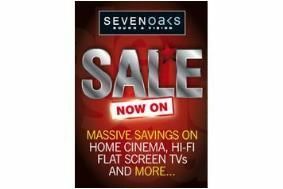 More exclusive offers in Sevenoaks Sale | What Hi-Fi? Buy any 32in+ flat TV with one of the following Blu-Ray players - Sony BDP-S360, Panasonic DMP-BD60 or Samsung BD-P1580 - and claim a free Award-Winning Chord Company SuperShield HDMI Cable valued at £50. In addition to the above offer, you can also claim a free five-year warranty on the Award-Winning Philips 42PFL9664H and five-star 47PFL9664H LCD TVs. NAD C545BEE, C326BEE and Dali Lektor 2 hi-fi system - £799 with £80 of free cable. To take advantage of these deals - which run until 31st December - please quote 'WHF.com' at purchase.